Follow us on social media and capture a moment with our brand or one of our products. Share your picture or video moment on your personal profile with hashtag #ElementsLife and receive a $100 digital gift card for our store if we repost it. Questions? View the Q&A on this page. 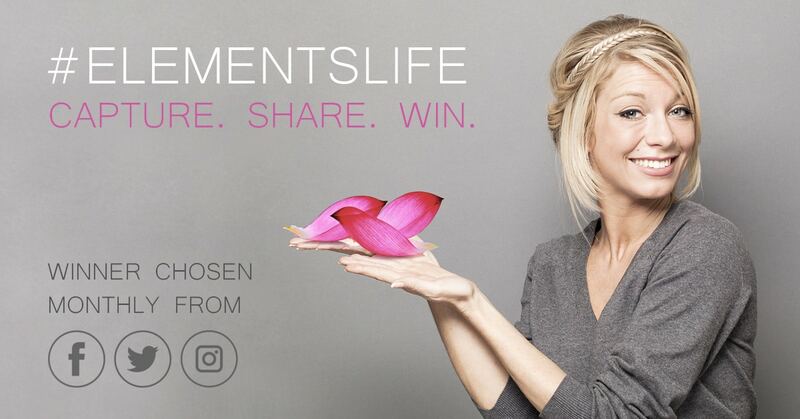 1.1 The monthly contest ‘Elements Life’ allows the general public to share social posts on Facebook, Twitter and/or Instagram with the hashtag #ElementsLife and be eligible to win a $100 digital gift certificate to the Pink Lotus Elements store (https://pinklotus.com/elements/). 1.2 The ‘Elements Life’ contest is exclusively for entertainment purposes. Any individual may participate by following the rules and regulations herein, and participation is always free. 2.1 Any person who has a registered user account on Facebook, Twitter and/or Instagram may participate by uploading their captured photo moment with hashtag #ElementsLife. Employees, partners or affiliates of Pink Lotus Elements are not eligible to participate in this monthly contest. 2.2 To participate, users must follow Pink Lotus Elements on Facebook, Twitter and/or Instagram and post a picture or video about a Pink Lotus Elements product or the Pink Lotus Elements brand on their personal account(s), using the hashtag #ElementsLife to validate their participation. Picture or video posts should tag Pink Lotus Elements whenever possible. 2.3 Participants will only be eligible to win for pictures or videos posted during the calendar month of the contest. Pictures or videos with earlier dates will not be considered. 2.4 Users who do not use the requested hashtag, use inappropriate words, images or videos, will be automatically disqualified without notice. 3.1 The ‘Elements Life’ contest is a monthly contest. It starts on the first day of each calendar month and ends on the last day of each calendar month. The contest can be cancelled by Pink Lotus Elements at any time and without any notice. 4.1 All posted photos and videos will be reviewed by a judging panel designated by Pink Lotus Elements at its sole and absolute discretion. 5.1 Images and videos will be evaluated based on how well they represent the Pink Lotus Element brand and/or the product featured in the post. Weight will also be given towards the originally of the post itself. 6.1 Around the 15th day of each month, for the preceding calendar month, at least one winner will be selected and announced on the Pink Lotus Elements official social media accounts. Whenever possible, Pink Lotus Elements will tag the winner(s) in such announcement. 7.1. The winner(s) will be entitled to a $100 digital gift certificate redeemable for any product available for purchase in the Pink Lotus Elements store at https://pinklotus.com/elements/. 7.2 Each winner, in order to receive the prize won, must establish a user account with the Pink Lotus Elements store at https://pinklotus.com/shopelements/myaccount/ within 30 calendar days of the announcement. Winners who already have an established account with the store will have their digital gift gift certificate applied directly to your account. 8.1 To participate in this monthly contest, the candidates for the prize automatically consent to and agree that their names, social media profiles, photos and videos can be published in any digital media owned by Pink Lotus Elements, at any time, without limitation to the number of times, in the USA and abroad without any remuneration or compensation being due to participants. 8.2 The participation in this contest by completing a post with the #ElementsLife hashtag is considered acceptance of these terms and conditions and each participant is responsible for their participation, declaring themselves now as legitimate and exclusive holder of their rights, being responsible for any misuse of the same, and exempting and indemnifying Pink Lotus Elements, its directors, officers, employees, shareholders and affiliates from any kind of liability that may arise out of a candidate’s participation in this contest. How often do you pick winners? Can I post something every month? Which social platforms can I use? What are your social handles? We chose at least one winner every month and sometimes choose more than one. The winner’s post can come from any of our three social platforms (Facebook, Twitter and Instagram). You can post with hashtag #ElementsLife as often as you would like. Winning once does not make you ineligible to win again during another month. We chose our winners based on on how well the captured photo or video represents our store and brand. Each post should contain at least one element that refers to our brand – in most cases, that would be a product featured in our store. We pick our winners from Facebook, Twitter and Instagram. Make sure to use hashtag #ElementsLife and tag Pink Lotus Elements in your captured picture or video so that we ca easily find your post. Participants must have a valid user account on either Facebook, Twitter or Instagram. We announce winners on social media around the 15th of each month for the prior month and will tag the winner(s) in our announcement.